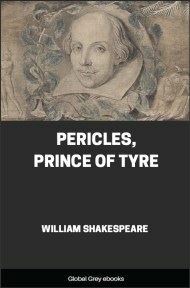 Pericles, Prince of Tyre is a Jacobean play written at least in part by William Shakespeare and included in modern editions of his collected works despite questions over its authorship, as it was not included in the First Folio. The play draws upon two sources for the plot. The first is Confessio Amantis (1393) of John Gower, an English poet and contemporary of Geoffrey Chaucer. This provides the story of Apollonius of Tyre. The second source is the Lawrence Twine prose version of Gower's tale, The Pattern of Painful Adventures, dating from c. 1576, reprinted in 1607.